We've just returned from a trip around the M4 corridor, taking in some more topics from our Homeopathic Vet Nick Thompson, as well as a couple more breeds for our library, and some more new subjects too. Have you heard of Schutzhund, otherwise known as IPO? It is little known here, but in Germany it is a huge sport. 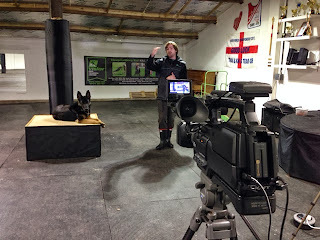 Schutzhund means 'protection dog' in German, and it is an obedience/tracking/protection combo mostly practised with the German Shepherd breed. Indeed, most GSD's will have a Schutzhund champion somewhere in their heritage, as this sport shaped the development of the breed. We spoke to one of the premier UK kennels practising this sport for a fantastic couple of videos coming soon. We also caught up with Pen Farthing, an ex-marine who now runs a rescue and charity called Nowzad Dogs, which is doing some fantastic work in Afghanistan pioneering the rescue effort over there. Nowzad will be our charity of the month when their videos go live. The Portuguese Podengo and Hungarian Puli were the breeds we filmed for the breed library, we thank their very experienced owners for their time. All in all, a very successful trip and we look forward to bringing you these articles soon.